The historic image shows a dirt road with electric lines traveling through town. Gardens are visible between houses and a school building (or church) in the lower, right corner of the photograph. There are more gardens, a barn, a silo, houses, a two-story industrial or commercial building (lumber mill?) and several stacks of lumber in the lower left corner. There is a church in the center of the photograph. There is a set of farm buildings and farm machinery just past the church. The landscape on the left side of the photograph has been cleared and is used for field crops and pastures. 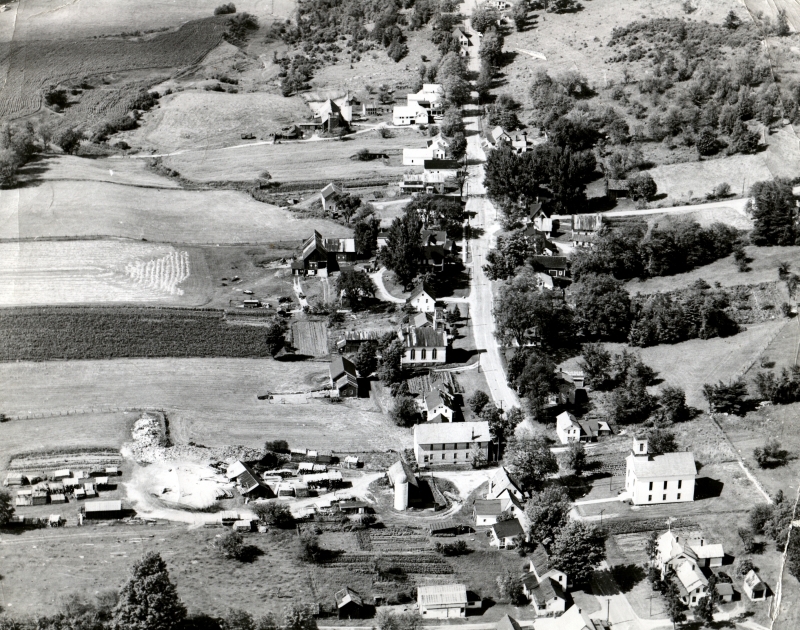 There are more farm buildings, houses, and gardens at the top of the image. It looks like summer. Esther Munroe Swift writes on 2005-4-12: Despite minor damage to this image, it is by far one of the best aerial views in the collection. Not only do the buildings show clearly, the terrain, trees and crop plantings also are clearly defined.